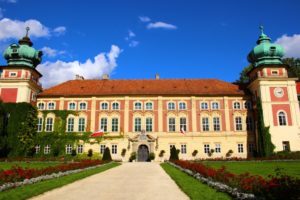 As most people visiting Poland go to Warsaw or Krakow to the most known tourist destinations, few know that this mysterious Eastern-European country has so much more to offer than that. Just rent a car from the capital or even better, take your backpack and go discover the countryside with local public transport. 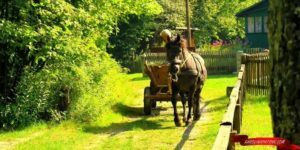 In this way you will learn more about the local life and people than by visiting the main tourist attractions with masses of other foreigners. Put on your adventure cap and go explore the unknown territories. Here are a few places that can be your inspiration on the way. We have no idea why so many people still haven’t heard of Lancut. It’s small town in Poland in just a 2 hr drive from famous Krakow with the gorgeous castle from the 17th centure. It’s colorful, monumental, and majestic both from the inside and outside. Lancut is not only a castle - it’s also unique, on a global scale, with its Coach House and beautiful English-style park. What’s more, in Lancut, there’s one of the few Distillery Museums of the world. So many amazing things in one small town! Lancut is definitely a must-see for every tourist visiting Poland. Roztocze is a great place to relax, breathe fresh air, and live in harmony with nature. It is a region in south-eastern Poland, very close to Zamosc and Lublin. Roztocze has a healthy micro-climate which is why many people spend summer there. It has beautiful forests and lakes. Roztocze is famous for its national park where there have been registered around 190 species of birds, including eagles, storks, and woodpeckers. Reptiles are represented by lizards, common European adders, and grass snakes as well as the endangered European pond terrapin. Designated hiking trails and roads make it easy to visit the park. There are also seven cognitive trails leading through the most interesting, cultural and historical sections of the park. It’s beautiful, unspoiled, and native. 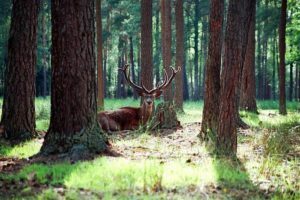 Bialowieza is home for European bison (zubr), the biggest land animals in Europe, which are very rare and under strict protection. Bialowieza is right next to Belarussian border and it’s home not only for bison. Wolves, boars, deer, and many other beautiful animals also live there. Since the border between the two countries runs through the forest, there is a border crossing available for hikers and cyclists. Solec Zdroj has mineral pools with the best sulfuric water on Earth. It cures many illnesses, especially skin diseases. People from all over the world come here to heal. It seems like Solec Zdroj is more popular abroad than in Poland. 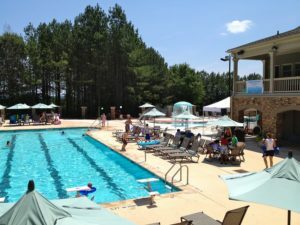 The pool complex is quite big with places to relax outside and inside. It’s heaven for free souls. People who don’t like any borders, prejudice and judgements. Many people sell apartments in big cities and move to Bieszczady to live a peaceful life, close to the nature. The Bieszczady mountains are close to the Ukrainian and Slovakian border. These mountains are unspoiled, beautiful, and unique. They are not high though- the highest peak is Tarnica, which is only 1346 metres. 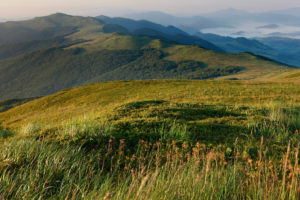 Bieszczady is famous for poloniny: mountains with meadow on the top. There are many great hiking trails which makes it a paradise for all outdoor-lovers.